This article was originally posted on Eric Sim’s LinkedIn blog. I wanted to bring this story to light because I’ve found LinkedIn to be a more important social media platform for me as I get older, but I had never met a LinkedIn “influencer” until I had a chance to meet Eric. He’s a very affable fellow! A recent Linkedin post went viral, accumulating 96,000 ‘likes’ …and the like count is still rising. The post in question is an inspirational one, titled the “8 Qualities Of The World’s First Michelin-Starred Street Food Chef” This article gives readers a walkthrough on the unique qualities of Mr Chan Hon Meng, the Michelin-starred hawker* and how we can all integrate Mr. Chan’s exceptional qualities into our own work lives. The question remains: how do some create viral hit content, while other posts languish and how do you build a platform and brand on LinkedIn? The author behind the viral piece is Eric Sim. 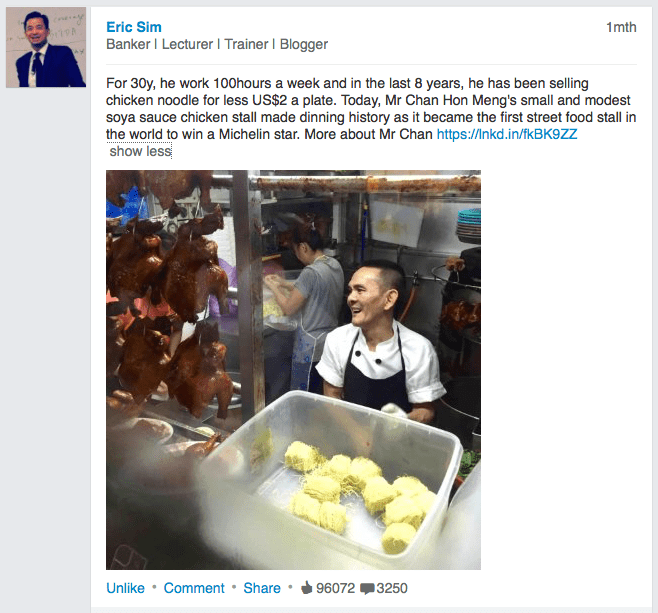 A hawker-turned-banker, Eric’s passion is teaching people how to develop themselves and lead a successful and happy work life. He advocates work-life integration and has gained an audience on social media, but his work wasn’t an overnight success. The first article he wrote was only ‘liked’ by three people – his best friend, his sister and a colleague – before he started begging his friends to read his article. Today, Eric no longer needs to ask friends to read his articles because now his audience has grown to over 100,000 followers on LinkedIn. Even more amazing is that he accomplished this in the span of just 18 months. Besides being an investment banker advising clients on M&A, financing and investment, Eric is also an Adjunct Associate Professor at Hong Kong University Science and Technology where he teaches key skills for finance professionals. If you’re looking for tips on building an audience on LinkedIn, Eric has broken down his growth into 3 stages that has helped him visualise the process better. Eric says, “At the beginning when you have less than a handful of followers, promote your work through your colleagues, friends and family. Everyone you meet, try to introduce your blog or content to them. Cross convert your FB friends into Linkedin followers. This brought me up to about 100 followers. The next step is to reach out to your network, people you’ve met at networking events, seminars or even acquaintances. Doing this allowed me to reach up to about 500 people. When you get to 500, you have a good minimum audience for the Linkedin algorithm to work for you as you share your content. When you have great content, your 500 followers will comment and share, helping you distribute your posts. I post a long article once a month and a short status update once a week. Whether you’re a multinational brand or a solo online personality, understanding what resonates with your audience is key in building a following. Eric’s LinkedIn blog has always focused on tips that help to improve life and work performance, yet each blog presents this information in an unique manner. For example, for “8 Qualities Of The World’s First Michelin-Starred Street Food Chef” he took his in-depth knowledge of hawkers to add extra depth and a unique spin to his article. This connection provides an extra level of interest to the reader. Eric is quick to understand that differences exist in social media audiences and channels, such as WeChat and LinkedIn. This often means his articles have to reflect this. “If I want to publish something on WeChat,” Eric says, “I’ll usually post around 5:30PM (local time) on there, because that’s the time a lot of Chinese state-owned enterprise workers will be heading going home on company shuttle bus. Dinner often starts at around 6pm.